It was indeed good of you to send me the excellent photographs of the pedigrees and to tell me that they had attracted a good deal of attention. As to those who made them including yourself, I should have though you would have all cursed the name of Darwin before the job was done! 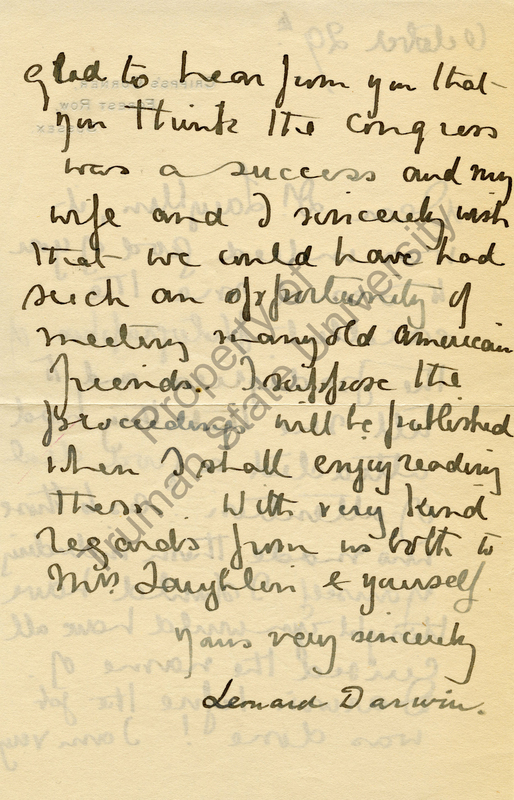 I am very glad to hear from you that you think the congress was a success and my wife and I sincerely wish that we could have had such an opportunity of meeting many old American friends. I suppose the proceedings will be published when I shall enjoy reading them. With very kind regards from us both to Mrs. Laughlin and yourself. The international spread of eugenic ideas often occurred in the correspondence and friendship between important eugenic leaders. 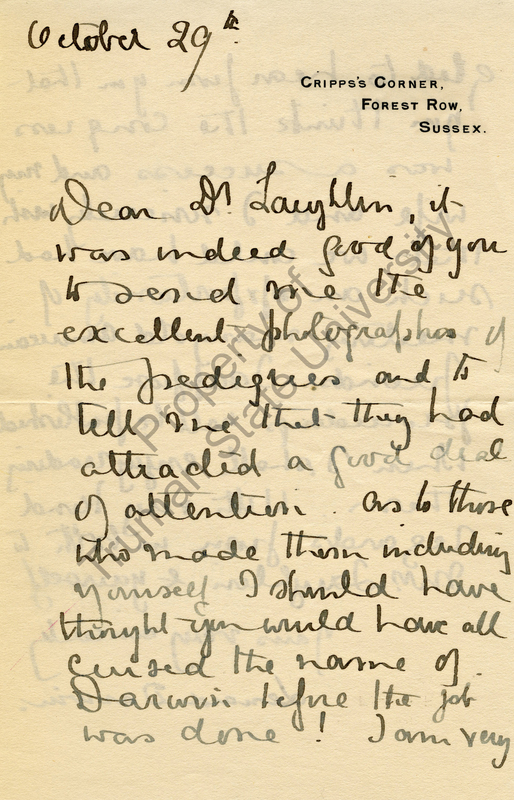 This is clearly shown in the volume of correspondence between Harry Laughlin and Leonard Darwin throughout the early twentieth century. Leonard Darwin had a personal connection to the formation of eugenics through his father, Charles Darwin, and his uncle, Francis Galton. His importance to the British eugenic movement was furthered through his role as the chairman of the British Eugenics Society from 1911 to 1928 and as the chairman of the First International Eugenics Conference in 1912. While British eugenics reached its greatest influence in the time before World War I, American eugenics found its peak influence after World War I. This trend was expressed in many of Laughlin and Darwin’s letters as Darwin served as an adviser to Laughlin on a variety of matters, such as the German eugenics movement. 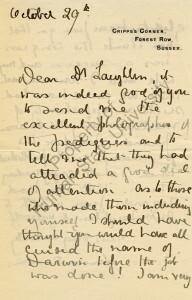 Laughlin in turn, studied Darwin and created a Darwin-Galton pedigree through requesting various photographs and books from Darwin himself—establishing both a professional and personal relationship between the two leaders. 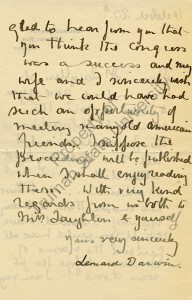 International correspondence and friendship between eugenic leaders was not limited to Laughlin and Darwin, as Darwin often expressed his warm wishes to his many other American friends through his correspondence. Darwin was even appointed to an honorary position as President of the American Congress within the Third International Eugenics Conference—which he declined due to his old age. 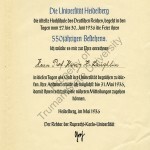 All of this seems to show that eugenics leaders held importance in their ability to influence and participate in eugenic movements outside of their native country. 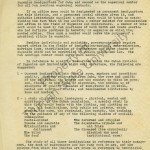 Image Source: Leonard Darwin to Harry H. Laughlin, October 29, , Harry H. Laughlin Papers, D-2-3:15, Pickler Library, Truman State University, Kirksville, Missouri.